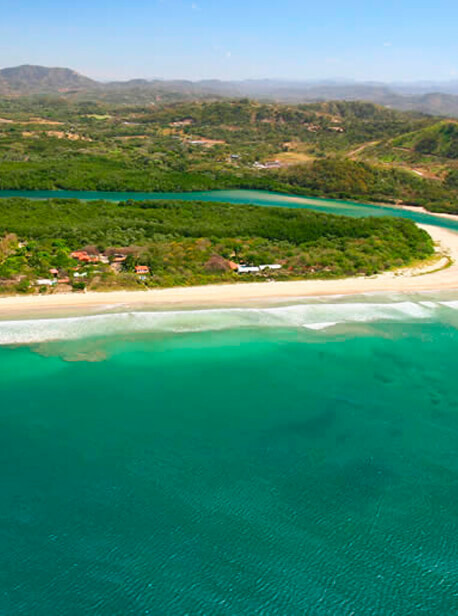 Playa Grande gets its name due to the great distance from its sandy start to where the sea reaches it, is a magnificent plain in extension of sand bathed by the sun and crystal blue water, which makes it one of the most beautiful beaches in Guanacaste. Located along the north Pacific Coast in Guanacaste province, Playa Grande is a vital part of the Marino Las Baulas National Park. After being incorporated into the park in 1990, the beach has been open to the public, but remains a highly protected region because it is a nesting site of the leatherback turtles. This beach is only accessible during the day because it is patrolled by police after 6 p.m. to help protect the nesting sites of leatherback turtles. Between October and May, turtles come ashore to lay their eggs during the night. Playa Grande is considered to be the most important nesting site of these turtles, and locals take pride in protecting this land for these massive creatures. Travelers wanting to catch a glimpse of these shy creatures can attend a tour from Playa Grande to Tamarindo.